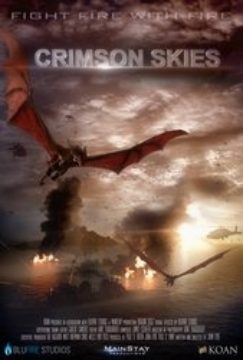 Crimson Skies was a planned sci-fi/disaster film announced in March 2014. It was to be directed by John Lyde and produced by his MainStay Productions in association with BluFire Studios. Promotional material was shown at various film markets for pre-sales, but it never left the development stage. "When a volcano erupts on a Pacific Island paradise, thousands of dragons wake from their centuries-long slumber to wreak havoc and destruction upon the Earth. It's all-out war as the Navy unleashes all its firepower to stop these fire-breathing beasts before there is nothing left." On Facebook, MainStay released a promotional poster under the original title of Dragon Seige. Later that month, they uploaded another poster and asked users to create a title font before they send it to sales agent Koan. MainStay then reported that Koan thought the Dragon Seige title was too "B-movieish" and asked users to come up with an alternative title. They ultimately settled for Crimson Skies as suggested by Spanky Ward. On April 4, 2014, a concept trailer was released comprising of visual effects footage created at BluFire. Koan listed on their website that the film would come out in 2015. Unfortunately, MainStay posted in September 2014 that they were unable to raise the $1.5 million budget necessary to make the film, but remained optimistic that it would happen in the future. Koan moved the release date to 2016 and then to 2017. When that year came, they removed the film from their website altogether. Nothing regarding the project has been announced since.